Commander Caius is an Imperial soldier stationed in Whiterun. He is in charge of the guards patrolling the hold under Jarl Balgruuf the Greater. Caius wears a set of Whiterun guard's armor and a pair of fur boots. He is equipped with a leveled sword which can be up to Daedric quality, and carries a selection of common loot and gold. If the Stormcloaks capture Whiterun, his position is taken by Sinmir. Caius will then move to the Blue Palace together with Balgruuf, Proventus Avenicci and Irileth. As long as Whiterun is under control of the Imperial Legion, he may greet you in a number of ways. 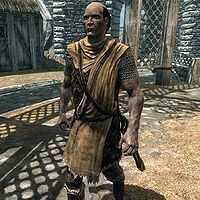 He may simply introduce himself: "I'm the commander of the guard here in Whiterun." He may reassure you: "My boys'll keep you safe. Don't you worry." He may give you a warning: "You're not thinking of causing trouble here in this beautiful city, now are you? 'Cause I'd strongly advise against such foolishness." He may simply ask: "Yes? What is it?" Caius' dialogue after the Stormcloaks have taken Whiterun suggests that he wasn't intended to be exiled to the Blue Palace, but rather be allowed to stay in Whiterun without his rank. This issue has been addressed by version 1.2.4 of the Unofficial Skyrim Patch. Caius' CWExile AI package is removed, and he instead stays in The Bannered Mare for the remainder of the game. This page was last modified on 14 April 2018, at 15:48.